The Digital Cinema Initiative (DCI) group was formed at the beginning of the film-to-digital transition to help develop the specifications and interchange formats needed for an orderly transition. Now, it has released a statement saying it plans to work on specifications for the next stage in theatrical exhibition: HDR Cinema. The motivation for this activity is the emergence of LED-based theatrical solutions that can deliver a much wider dynamic range than most projection solutions. The memorandum was issued to put a stake in the ground to let manufacturers know that DCI will be working on a host of issues to help develop the specs and maybe a compliance test plan for new direct view theatrical display solutions. Back in the day, the DCI group, led primarily by studios, worked with projector makers, lead primarily by Texas Instruments, to develop the Digital Cinema System Specification (DCSS) and a Compliance Test Plan (CTP) for the projection systems coming to market at that time. This also included a security protocol to make it very hard for thieves to tap into the digital signal anywhere in the chain. The industry also spearhead the Virtual Print Fee (VPF) system designed to transfer the cost saving studios would incur by not printing film and distributing content in a digital format. These savings, the VPF, were then used to finance the purchase of the new projection systems to help the exhibitor bear this burden. While the cost of SDR projectors has come way down, the EDR and HDR solutions are more expenses – sometimes very expensive. There is no cost savings for the studios to upgrade to EDR or HDR presentation in the theaters, so don’t expect any VPF-like deals for this next stage. In fact, expenses for the studios are likely to increase as they will have to add even more mastering variations to the mix. Finding a way to standardize the direct view performance, have a common distribution format and finding ways to reduce mastering variations are the motivating factors for the studios to be involved again. The memorandum, available here, first defines what a direct view display is, then begins to list all of the parameters that will need to be defined by DCI. The document does define some parameters but leaves many still to be determined. For example, the new spec will need to support the current EOTF gamma 2.6 for SDR distribution, but it has chosen the PQ curve for HDR content. EclairColor’s format does not use either, so where does that leave them? Color encoding will continue to use the X’Y’Z’ system with a D65 white point for 100 cd/m². A big change is in scaling. To date, no scaling of the DCI-delivered content has been allowed, but the new spec will allow it if manufacturers, “clearly demonstrate that no artifacts result.” Will DCI specify the metrology to demonstrate such performance? We don’t know at this point. Why is scaling important? Because with direct view display, the pixel pitch is fixed. Want a 4096 x 2160 resolution screen – that implies a specific width and height of the screen. Want to make the screen just a little bit bigger to fill the space you have? With the old rules, the pixel pitch would have to change requiring a completely new series of modules – not a cost effective approach. 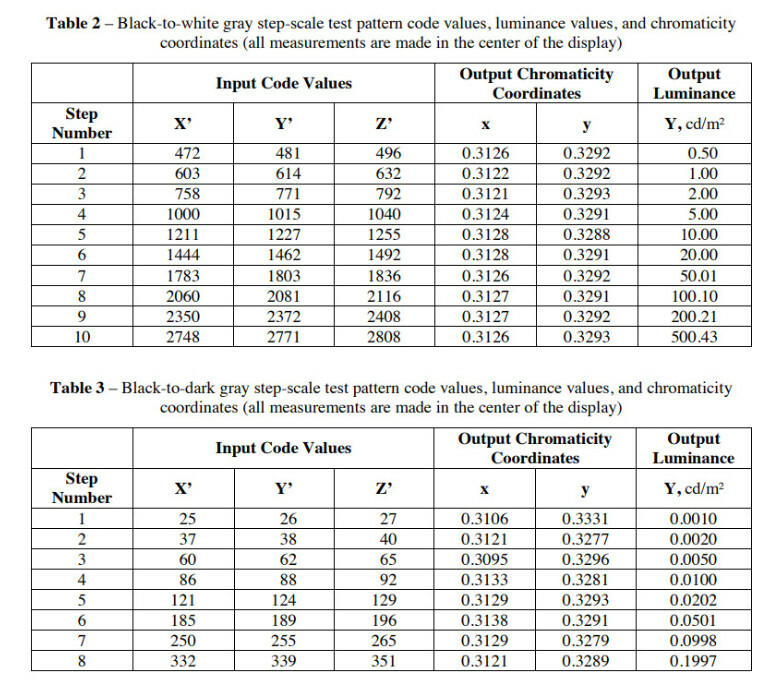 Another interesting part of the memo is the two tables that define how X’Y’Z’ encoded content is transformed to x’y’ chromaticity and luminance values, as shown below. Note that the peak luminance is now 500 cd/m² and the minimum black level (for the first code value) is 0.001 cd/m². I am sure there is going to be a lot of debate on these ranges as well as what the average picture level should be. Remember, a cinema is a dark-adapted environment and we recently heard testimony at the QLED and Advanced Display Summit that one of the big advantages of the new LED screens is the ability to see lots of detail in the darker parts of the picture. There is much human visual system science to consider here. The memo is a good first step to help provide guidance for an industry that must evolve to stay relevant. Clearly there is much work to be done on the spec side, but the input of filmmakers is vital too. To that end, some (including myself) are exploring ways of how to engage filmmakers, including the development of new rights-free HDR evaluation material. If you have ideas or interest in this, please feel free to reach out to me directly.